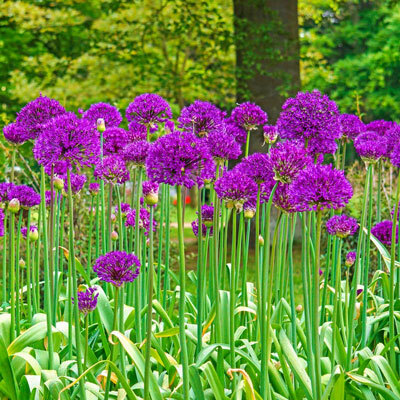 ALLIUMS: Carefree and rewarding! Lilac purple flowerheads, 10 cm wide on 60-90 cm stems. Excellent cut flowers, blooming in May. Foliage Type: Basal leaves are strap-shaped, up to 4" broad and die away soon after blooming. Soil Requirement: Will grow in just about any well drained soil. Additional Information: Allium possess oniony smelling flowers and foliage.